New turfgrass variety is leading on ground performance! 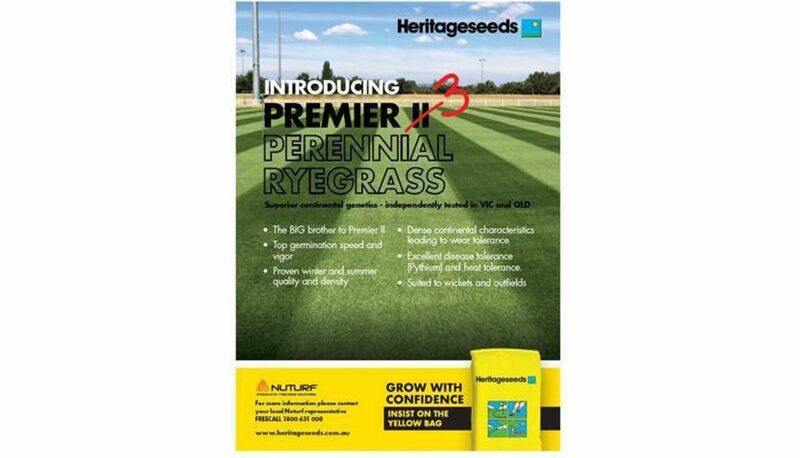 Heritage Seeds has launched its new turf perennial ryegrass variety Premier 3 (see attached brochure). The next generation of a longstanding Australian turf favourite, Premier 3 boasts fast establishment and proven wear tolerance, making it an excellent choice for cricket wicket and sportsfield surfaces. “Premier 3 is the latest product to come out of the Barenbrug breeding program and responds to customer demand for a good-looking, dense turf with proven wear tolerance for use on high-traffic sporting arenas,” explained Heritage Seeds Turf Portfolio Manager Matt Merrick. “Innovation is a major driving force for the Barenbrug Group, and we are continuously improving our grass varieties by applying new genetics and technologies to ensure that our customers can grow with confidence,” Matt explained. With high endophyte, Premier 3 displays strong persistence and resistance to insect pests. It also has excellent disease and heat tolerance, and its deep green colour means it also ranks highly on visual appeal. Agronomist John Neylan of Turfgrass Consulting & Research has been undertaking an independent assessment and statistical analysis of the ryegrass trial at Heritage Seeds since it was seeded 18 months ago. “Premier 3 ryegrass was amongst the best varieties for germination and seedling vigour and has been consistently amongst the top performers for turf quality and density,” he said. John said that Premier 3 ryegrass has also been statistically amongst the best ryegrass cultivars for both winter and summer turf quality and density. For more information about Premier 3 contact Matt Merrick, Portfolio Manager – Turf, Heritage Seeds at mmerrick@heritageseeds.com.au or your local Nuturf turf representative.